Reach the NASFAA attendees with a unique opportunity — an educational burst of information right on the exhibit hall floor. A 20-minute session on the exhibit hall floor in the presentation area where you can provide an overview of your product or service. All conference attendees can observe, but we will have seating for 50 people. Seating is first come, first serve. On Tuesday and Wednesday beginning with the coffee and pastry offering in the morning and throughout the day. See the schedule below for specific times time slots available. * Time slot does not conflict with any conferenceinterest sessions. Current NASFAA members who are exhibiting. What is the deadline for submission of information? April 5, 2019, through the online submission portal on your Exhibitors Corner page under Options—Call for Submissions. How will attendees know you are presenting? The Learning Lounge presentations will be listed in the schedule details online program PDF, on the app, in the Conference-at-a-Glance, and on signs in the Exhibit Hall. NASFAA will provide a monitor and audio system. If internet is required, NASFAA recommends a dedicated Wi-Fi connection available through the convention center exclusive provider (TBD) paid for by the presenter. $750 for one 20-minute time slot. NASFAA does not guarantee to workshop presenter any specific attendance number for these sessions. Learning Lounge sessions are on a time schedule and it is the responsibility of the exhibitor to adhere to this schedule. Failure to do so may result in loss of the opportunity to present the scheduled workshop. Priority is given to early submission and the date the request is received. All material will be reviewed for relevant content and quality. The decision by NASFAA is final. 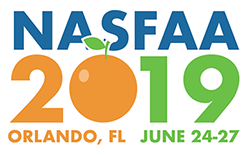 The participating exhibitor agrees to hold harmless NASFAA with regard to any issue arising from or relevant to the exhibitor’s presentation in the Exhibit Hall. To sign up, or if you have any questions, please contact Mary Nokes.